The scale and nature of illegal wildlife trade have changed over the years and so is the global response . In June 2012 Heads of State and government at Rio+20 explicitly recognized the economic, social and environmental impacts of illicit trafficking in wildlife, the need to take action on both the supply and demand sides, and the important role of CITES. In March 2013 CITES Parties heeded this call, when over 2,500 delegates from 174 States and observers gathered in Bangkok for the 16th meeting of the Conference of the Parties and took strong, action-oriented decisions to combat illegal wildlife trade that address both demand and supply. The implementation of these significant decisions is underway and scheduled for review by our Standing Committee next month. One outcome that resulted from this critical meeting of CITES Parties, though it is not contained in any written decision, was the shift away from pointing fingers at one another, and seeking to apportion blame, to putting our collective energy into how we can solve the problem by working together across the entire illegal supply chain. The benefits of this collaboration across source, transit and destination States are now increasingly evident – such as the excellent results achieved through Operation Cobra II, a joint enforcement initiative undertaken earlier this year between 28 States across Asia, Africa and North America. We have also seen five key intergovernmental agencies dealing with wildlife crime form a new alliance called the International Consortium on Combating Wildlife Crime (ICCWC)  – an initiative that is providing coordinated support and technical assistance to countries, including on the use of sophisticated investigative and anti-money laundering techniques, the sharing of intelligence and modern forensics. Within the UN system, the UN Office on Drugs and Crime has shown great leadership in addressing the crime, justice and security aspects of illegal wildlife trade and the UN Development Programme is taking the lead on addressing issues of livelihoods and human development, which are critical to finding long-term solutions. The degradation of World Heritage Sites across Africa due to poaching for the illicit trade, such as the Selous Reserve in Tanzania, is threatening tourism and economic opportunities – and CITES and the UNESCO World Heritage Centre have joined forces to help implement CITES decisions in these sites. And on UN World Wildlife Day, celebrated for the first time on 3 March this year, UNEP Goodwill Ambassadors sent personal messages on the need to reduce the demand for illegal wildlife products. Outside of the UN system, we have also seen the deep engagement in this fight of INTERPOL and the World Customs Organization and of regional and global financial institutions including the African Development Bank, Asian Development Bank, the GEF and the World Bank (as well as national donor agencies). Overall, we are seeing better law enforcement and demand-reduction efforts across multiple countries – and CITES strong decisions and unique compliance processes underpin this collective global effort. The issue has also been addressed by the UN Security Council, in the margins of the UN General Assembly, by ECOSOC, through multiple regional fora – and civil society from across all regions has been mobilized and is playing an indispensable role. Distinguished Delegates, as you can see from this brief snapshot, this issue is firmly entrenched on the global agenda and we are seeing unprecedented levels of international cooperation in tackling it. Today we welcome the further political attention given to this critical issue through the first UN Environment Assembly, which will, in particular, draw attention to the environmental dimension of these highly destructive crimes – including on biodiversity and ecosystems and the services they provide, which is a perspective that has been largely absent from the global discourse. But, Distinguished Delegates, ultimately this fight will be won or lost on the front lines, whether in the field, the courtroom, or the market place – not in a conference room. Generating political momentum is a means to an end not an end in itself – and we must use the high-level political attention given to this issue over the past three years to deepen and sustain support for those who are serving in the front line – rangers, inspectors, Customs Officers, local and national police, security and defence forces, prosecutors and judges – and national environment agencies must play their part in this collective endeavour. Finally, we encourage this unique global Assembly of Environment Ministers to look beyond the immediate threats posed by the illegal wildlife trade that fall within the remit of CITES and to also look ahead to a wider set of threats to our wildlife that lie on the horizon. Here in Africa for example, the human population is expected to double to 2.4 billion by 2050 and as the continent becomes more prosperous and its resources are further exploited we will see emerging threats to wildlife, especially to large animals that need space to roam, from increasing habitat loss, new infrastructure and growing urban centers. As we tackle the immediate threat posed to people and wildlife by poaching and smuggling, an Assembly of this nature may also wish to offer a global, longer-term perspective on the multiple threats facing our wildlife and how we can help equip the world’s Environment Ministers to offer coherent and effective solutions to their governments. Distinguished delegates, there are many dimensions to the threats faced by our wildlife but through our collective efforts we can secure a sustainable future in which people and wildlife can co-exist in harmony. 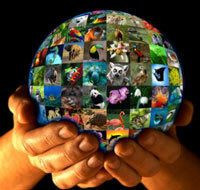 CITES chart and description on high-level events and initiatives.